Capadia Designs: Win a Spot for True Scrap 6! True Scrap 6 is less than two weeks away. I'm going - do you want to join me? 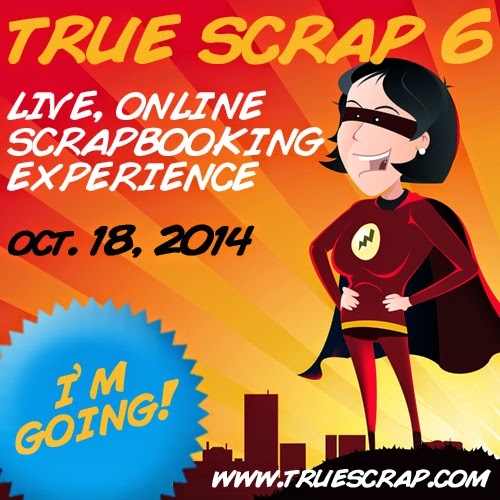 I've attended True Scrap several times and I always learn a lot and have a lot of fun! Would you like to hang out with eight inspiring and talented scrapbooking instructors without leaving home? At True Scrap 6, you can experience the best in online education - everything is LIVE so you don't lose that feeling of community and excitement that comes with an in-person event. You can join in from the comfort of home with all of your supplies close at hand - no need to pack and travel to learn from these great instructors! It's all streamed live and it's all recorded so you can revisit your favorite classes again and again. It's really the best of both worlds - you can sit back and enjoy the sessions knowing that you will be able to rerun them at your convenience. So here's the BIG NEWS! Return here and leave a comment below by midnight, October 9, about which class you're most excited about. And here's something for EVERYONE. Not sure you'll be lucky enough to win a spot? 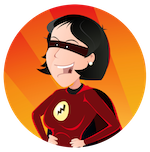 No worries - you can use coupon code “HERO” at checkout to save 20% off the regular registration rate. Just head over to www.truescrap.com and get yourself signed up! (Coupon expires 10/13). I am really looking forward to this event and I hope to see lots of you in the chat room! thank you for the chance to win a seat in true scraps 6! the mini books techniques looks very interesting..
Interactive Mini Book Techniques looks like a wonderful class. This is great thanks for the chance to win a spot in this online scrap. They all sound great and it is very hard to choose one. But here goes I think I am the most excited about saw this made that class. It would be such an amazing prize tone able to join any one of these fabulous teachers but i have to say that I have a soft spot for Nichol Magourik! Thank you for giving us a chance to attend! All of the classes look fantastic! Thanks for the chance to win. What great classes! The mini book one and the photography one look awesome! Saw This, Made That: Bringing Ideas To Life is the one that caught my attention first. Thanks so much for this opportunity. Interactive Mini Book Techniques. I would like to make mini books for my grandchildren. There were other classes that looked very interesting, but I like to learn something new every day. Thanks for the chance to win. I think that Small Details, Big Picture would be the most interesting to me. Kelly Crowe's "Saw this Made that" sound really interesting. I would love to see tht one, though they all sound really good. Thanks for the chance to win. I appreciate the opportunity to win. I really like the mini books, but they are all of great interest to me. I made a scrapbook of my fathers time in the navy, and between doing a lot of research as well as getting everything in chronological order, I spent a ton of time on it. The scrapnars have been helpful on time management and would love to learn so much more. The next big thing is going to be for my parents anniversary, an album from wedding day to current. The Layering:Punch it, Roll it, Make it yours sounds intriguing!